I tried for so long to resist the Sleek Pout Paints thinking I wouldn't use them. But then one day when browsing Crush Cosmetics (seriously, who browses an online makeup store without intending to purchase?) I saw they had started stocking these and all resolve just melted away. I bought 4 colours: Peek a Bloo, Pinkini, Cloud 9 and Mauve over. Pinkini and Mauve Over are great worn on their own, but the other two I got as mixer colours so I could lighten or darken the other shades, or create a completely different shade. No matter how adventurous I am with my lip colours, I cannot see myself ever wearing the blue or the white on their own. This is an extremely bright cool toned pink. It's much brighter in real life than in any swatch that I've seen. It's a bit OOT when worn opaque, but it looks gorgeous as a stain. 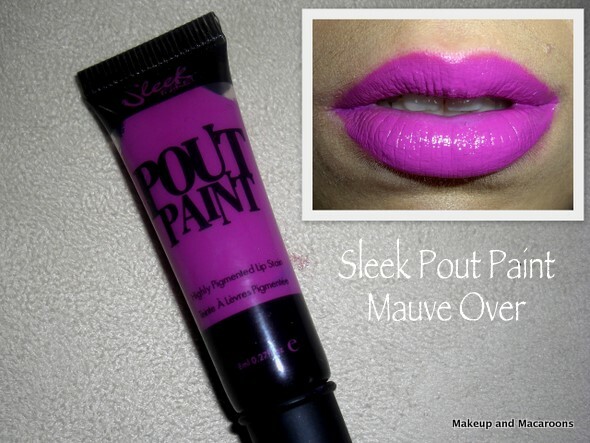 The pic below is the pout paint worn opaquely. I love this purply mauve colour. I've worn it quite a lot, but as a stain and opaque. It goes great with a grey smokey eye. There are two photos of me wearing this colour in THIS post where I've got a purple dress on. Here are a few quick colours I mixed up with the shades I have. In this last photo I applied the white straight on top of the blue/pink mixture, which is why there's that horrible dark outline. The proper way of doing it is to mix your colours first then apply, rather than mixing them on your lips. 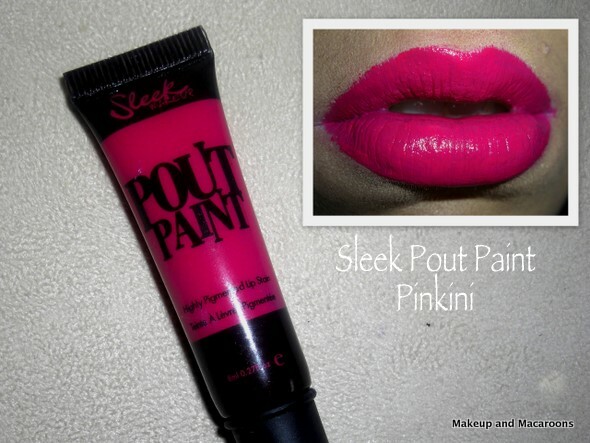 Have you tried the Sleek Pout Paints? ha, you have the same 4 that I have!! I love them, but I haven't really used them much. Next time I go out I'm going to road test them. I've always wanted to try OCC lip tars which look quite similar to these. It looks like so much fun mixing up a custom, unique lipstick! Oh wow, these are fabulous! I am loving Pinkini and Mauve Over. Definitely going on my wish list! Did you get your OSS palette?! I am IN LOVE with the blue and purple mix! Alina - thanks hun. They're a bit thicker than OCC liptars but the idea is still the same. Beauty Discovered - crush cosmetics is too dangerous for me, I always end up buying more stuff than I intend to. Shannon - You should get some, the combinations you can come up with is amazing. Sal - great minds think alike, LOL. They're a good basic mix of colours in my opinion, good to mix them up. Pink Glitter - It sure is fun, but it's also messy! Moonchild - thanks hun, I think the first one would be great for an autumn/winter look. Ebony - I did! My OSS arrived yesterday actually so I haven't even used it yet. The colours are sooo pretty! Yvette - I like the feel of OCC on my lips better, they feel lighter, but the Sleeks last way longer. Angela - really? I thought it was a bit too purple. Sounds like you need to get these and make your own colours! I got mine sometime back. Its fun to play with but dont use it as such. Plus guess I got the wrong shade apart frm the blue, white and red, feel so now! - peachykeen - pinkini seems pretty! Your third custom creation looks NICE! Jesster - no I haven't mixed OCC and Pout Paints but great idea! thanks.